This clinic is not about the 3×3 game itself. It is how to make players stronger for the 5on5 game by using 3×3 in different ways in practice! I checked on the situation in other countries like Serbia and Germany. 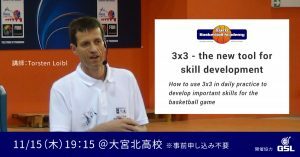 3×3 is now used often for skill development – Japanese coaches need to know about it, even if they don´t practicipate in any 3×3 events.